This articles assumes that you have already installed JV-Relatives on your website. Installing the component would have already and automatically installed the modules and plugins that will be displaying the related articles output on the front-end. But the important decision you need to make now, is to decide the type of extension (module or plugin) you will use to show that output in Joomla articles, K2, EasyBlog or Cobalt. 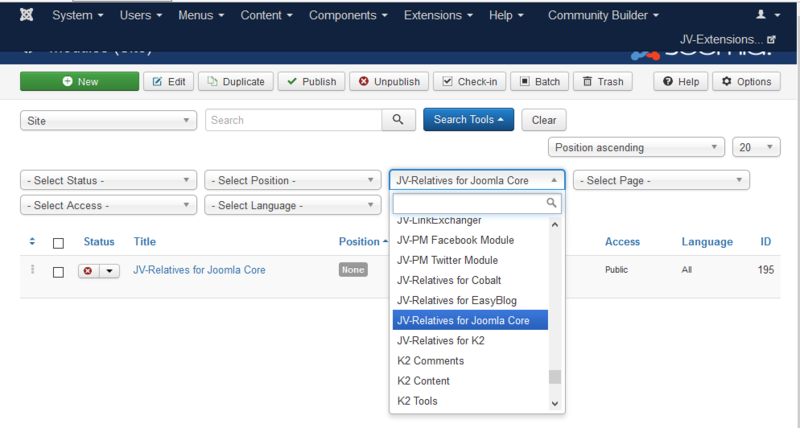 If you are planning to use JV-Relatives for Joomla articles or K2 or EasyBlog, then you have the option to choose between JV-Relatives Plugin and Module. Alternatively, if you plan to use it for Cobalt, then you have the option to choose between JV-Relatives Cobalt Field and Module. Based on your decision, please visit the Joomla back-end Plugins or module section, and enable that specific module or plugin using 'Extensions' menu, or add field to Cobalt content type as desired. It is very important that you configure the plugin or module or field settings via Plugin or Module or Field manager in Joomla. Enable/Publish either the module or plugin/cobalt field and not both. Enabling both will show the output twice in the page. How to decide between Module and Plugin/Field? As you aware by now, JV-Relatives provides 2 different integration interfaces for displaying related articles. You can now decide the integration interface based on your needs, and it purely your choice. With the plugin you have the option to show the related articles at the top or bottom or anywhere in the article. You can also use the scrolling magic feature to automatically show the related articles at a particular position as user scrolls the article. You can choose the module instead, if you want the related articles to appear distinctly separated from the article like the sidebar. This also gives an additional benefit of placing the module in any available module position in your Joomla template.